A letter describing life at Barham house addressed to Lord Baldwin. I work in the workshop. The workshop has to do all the craftsmen’s work in and outside the house. We have a lot to do. For we live in a very old house, which was built in 1766. There are floors broken in the house, which we have to repair. In another place a piece of the ceiling has come down which must be mended. Broken chairs and benches are repaired by us, windows put in, doors planed for the winter. In between one of the housemasters come running along asking for some paint or nails or tools. At the moment we are just doing the tailoring shop. It is a very large room, in which nothing has been repaired for a long time. From an old niche [recess] we have made a cupboard; and an old cupboard in the wall with stones and rubbish we have cleaned; we have stopped the holes in the walls, pulled out old nails, put in new boards and painted it. We collect all the old wood in the camp and cut out all good pieces; the rubbish we use for making fires. 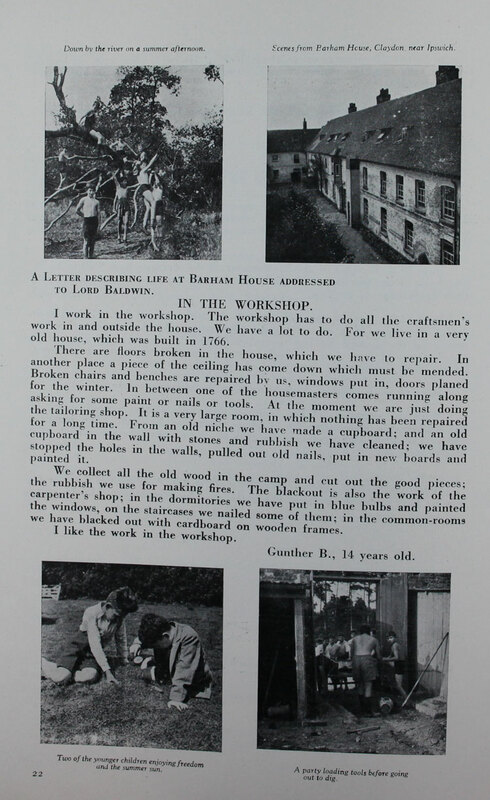 The Blackout is also the work of the carpenter’s shop; in the dormitories we have put in blue bulbs and painted the windows, on the staircases we nailed some of them; in the common-room we have blacked out with cardboard on wooden frames. Gunter B., 14 years old.